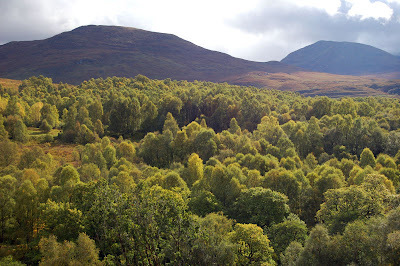 The time of year to go and look at trees has just passed its climax. The pre-dawn skies are storm-rent on the way to work, the stars are out, and silvery, moonlit clouds race across the sky, great masses in the sky ripping in pieces like bits of wet tissue paper. Small branches, leaves still on them, land at my feet. 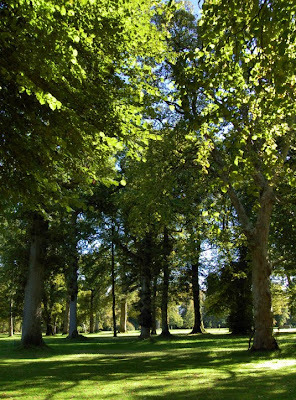 So where will you go at the weekend to look at the trees? The forecast is reasonable. 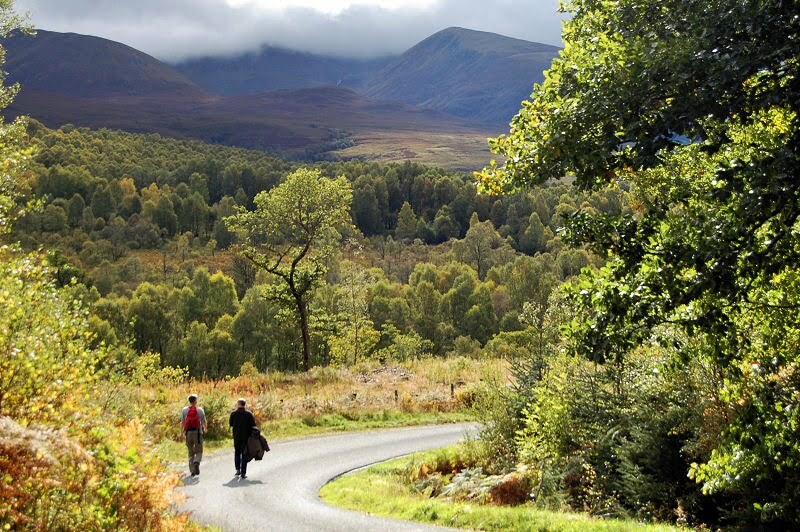 With the wind loosening the leaves, now is the time to go. You might choose spacious Glen Affric. Or the stately woods of the Tweed. What about the North Atlantic Rainforest around Argyll and Lochaber, or the perennial favourite, Perthshire? 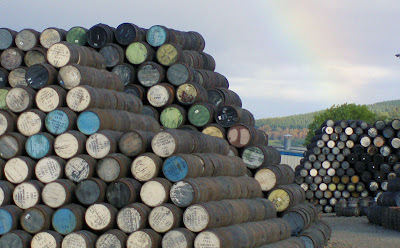 On a cold autumn evening like tonight, a wee dram warms you up nicely. Away from Mountstuart and Rothesay, the visitor finally feels they are getting into Bute proper. 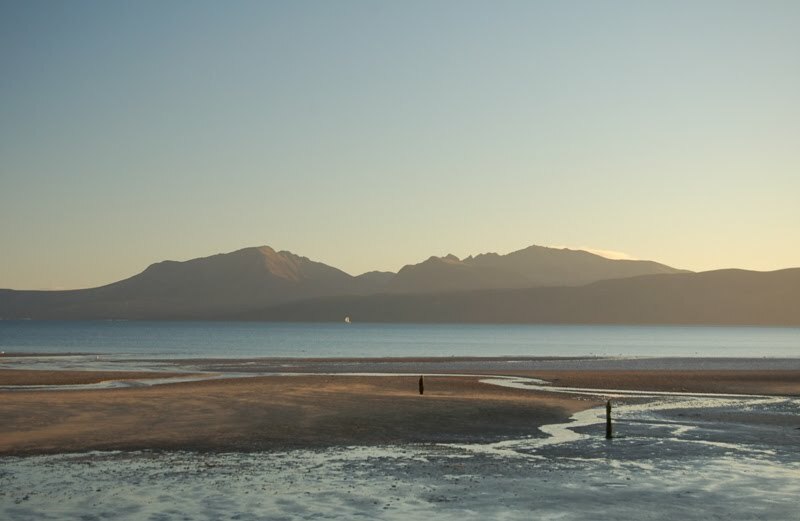 This is the Bute as described in Alex and Bob's Blueskyscotland, a pastoral place of majestic horizons, thanks to its position as a low-lying island in the Firth of Clyde, surrounded by the mainland and other island hills. We lunched on the bay next to the prehistoric fort of Dunagoil, watching yachts in the glittering Firth of Clyde, planes from the nearby grass airstrip, and eating brambles picked from the roadside. I've never seen them in such profusion! Dunagoil is an iron age vitrified fort, very difficult to access as it is surrounded on all sides by low cliffs of columnar basalt. Lots of domestic remains were found when the site was excavated in the 20th century. This was someone's home, back in the days when an inacessible cliff-top site and solid curtain wall round your settlement was considered prudent. 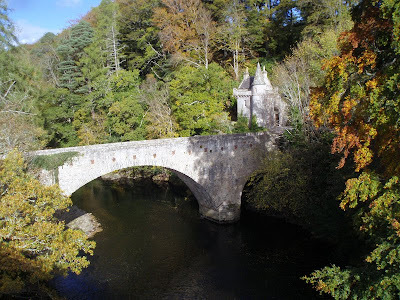 It is short stroll from Dunagoil to the tucked-away chapel of St Blane, so we wandered there. The info boards at this secret spot state that St Blane was the illegitimate son of Ertha. 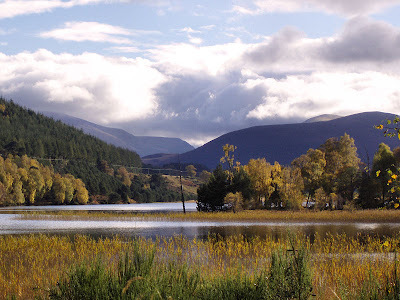 Ertha's brother St Cattan ran Kingarth on the other side of Bute, the religious centre for Cowal, and set her and her infant adrift in a currach (they weren't all nicey-nice, the old saints). They survived this ordeal: the boy was raised in Ireland and returned to Bute as a monk, founding a chapel at St Blanes. There is a peculiarly restful atmosphere at this spot in the early evening light. 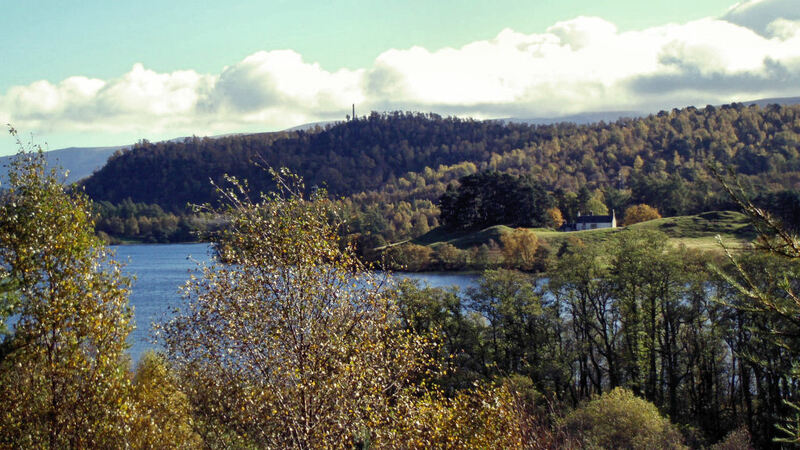 A small cliff face to the west should create a claustrophobic feeling, but the configuration of trees, rocks and a well, with an outlook to the Firth of Clyde and St Blane's Hill, creates the opposite feeling. Perhaps this was a sacred spot before St Blane's arrival: in pre-Christian Scotland, wells often were considered sacred. The year of St Blane's death was 590, in what used to be called the dark ages - but a more accurate description for the area, which produced great works of mobile art and scripture like the Book of Kells, would be the age of saints. It had been a day of beautiful soft light characteristic of the Argyll coast and we were content, despite a lack of energetic traipsing round the rough ground on the very southern tip of Bute beyond St Blane's Hill. We returned to Rothesay via Scalpsie bay for sunset. 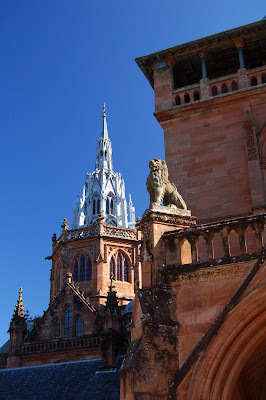 From Rothesay (see previous post) the tourist heads, inevitably, to the great house of Mountstuart. 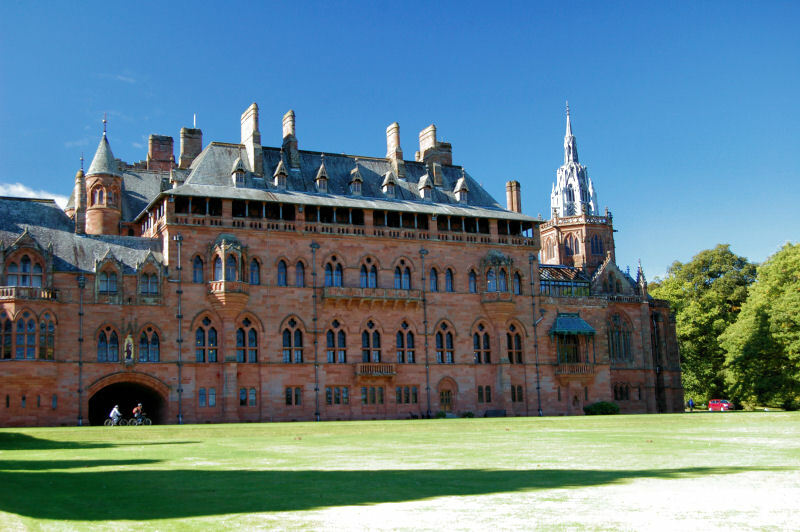 In a land studded with the gothic piles of the aristocrats and industrialists of the steam age, Mountstuart stands out as one of the grandest. 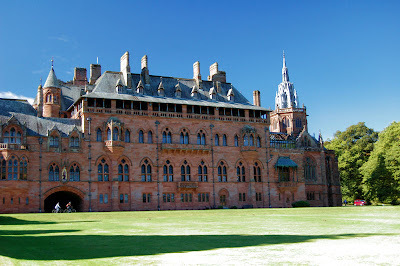 The Stuart monarchs of Scotland traced their origins back to Norman overlords on the Clyde in Renfrew, and the hereditary Earls of Bute came from the same aristocratic family. 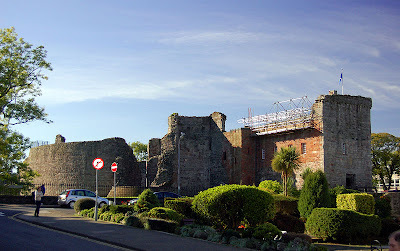 For a long time they lived in Rothesay Castle, but moved to a Georgian house outside Rothesay with a bit more privacy and landscape. The 4th Earl, John Stuart, was promoted to a Marquis, and his son the 2nd Marquis of Bute, also named John Stuart (as has been every Marquis since), had the great fortune to marry, at the height of the industial revolution, the heiress of South Glamorgan in Wales. 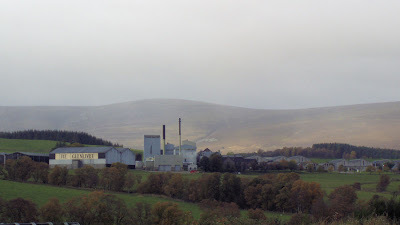 This area today is known as the Welsh Valleys, each valley floating on the original black gold - coal. It was the modern-day equivalent of marrying into the Saudi royal family. John sank much of his wealth into exploiting the coal mining, building much of modern Cardiff. He died in 1848 and didn't live to reap the fruits of his investments, but his son, the 3rd Marquis, made up for this. If you are one of the richest men in the world, why continue to live in a modest Georgian mansion? John had an interest in architecture, and created the vast Cardiff Castle and ornate Castell Coch in Wales. And in a similar vein, in 1870 he decided to replace his family home with something a little more grandiose. 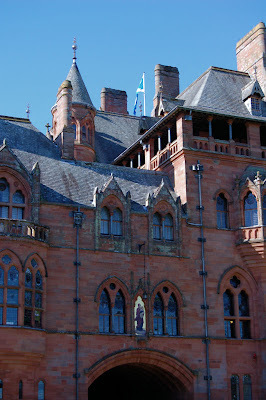 The family is not as rich as it once was, and the castle must nowadays pay for itself as a tourist asset. It is not permitted to photograph the interiors: a pity, as these are the most impressive part of the castle. Giant Japanese vases big enough to hide in; marble gothic arches and moorish cupolas, blue and gold, inlaid with gemstones; stars and godesses painted on ceilings; chairs stolen from the tomb of Tutenkhamen; and vast murals covering the walls, the remaining spaces taken up with portraiture from Raeburn, Ramsay, and a few other daubs from the likes of Titian, Tintoretto and Velazquez. It is even possible, if prohibitively expensive, to hire parts of the castle for functions - the entire castle and grounds have even been hired for a whole week for a wedding. Mind you, in this case the bride's father - Paul McCartney - could afford it. After the impressive excesses of Mountstuart, we were keen to see the 'real' Bute, and pushed off even further south into the most beautiful, mellow, sunny early autumn afternoon. Rothesay was the end of the cruise except for those staying on board for a steam round the Kyles of Bute. 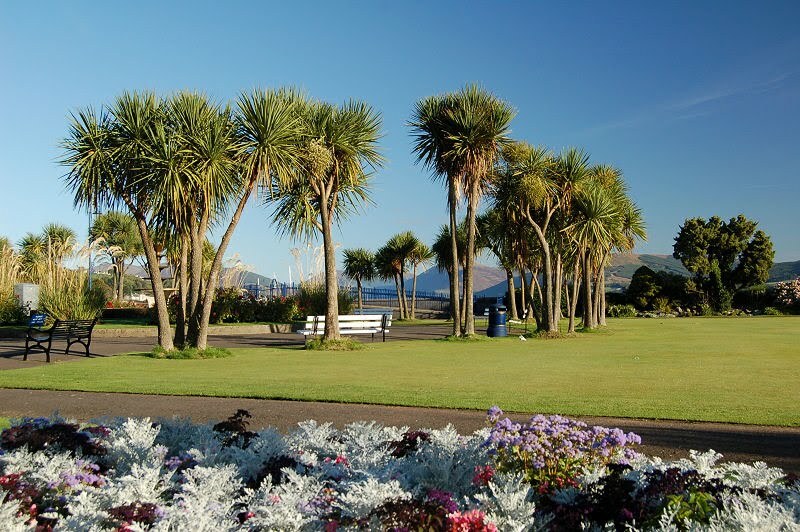 Although Rothesay is only the main town on Bute, for some reason we'd say Rothesay when we meant the whole island. Could this be a folk memory of an older name? It's not impossible. 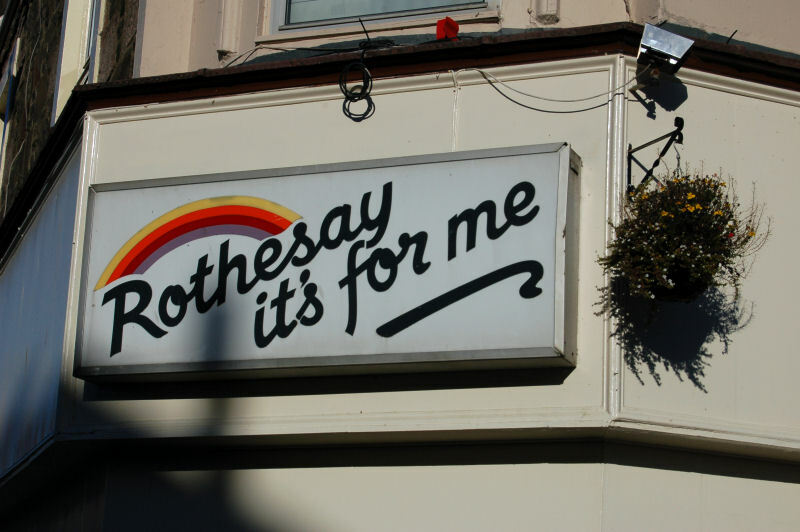 After all, Rothesay sounds like Hross-ey, horse-island in old Norse. And similarly, Weegies often say Millport when the mean the whole of Cumbrae. I don't know how widespread this practice is. But it is like referring to the Isle of Stornoway or the Isle of London. 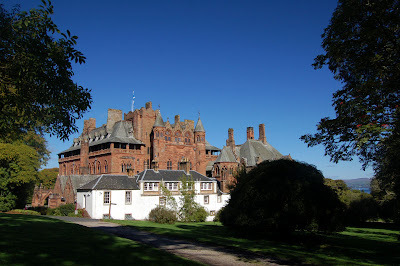 In all my visits to Bute until now I never made it past Rothesay. The Waverley would return after a couple of hours from the Kyle so there was little time to go anywhere else. 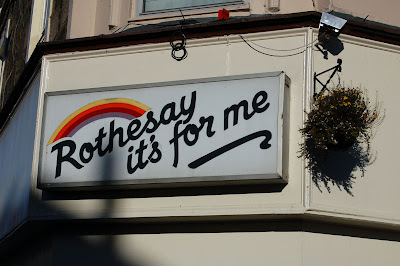 I returned recently, and the changes that have happened since the 1980s seem to lie lighter over Rothesay than the rest of the world - at least in the decor of its main streets. 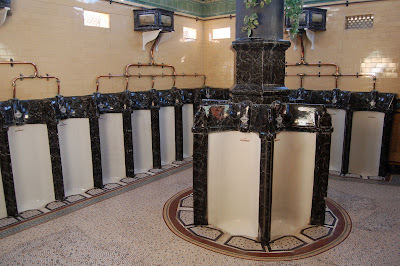 However the Victorian pavilions on the seafront have been restored, with an unusually ornate gents public toilet. Women are allowed in for a peek if there is nobody using the facility. Hold your nose, ladies! Being on the mild side for Scotland, and being an old established holiday island, Bute seems to have forgotten itself. Where are these palm trees, except on the seafront at Palma? And what is this sun-drenched keep, except a castle of the Templars in the Balearics? 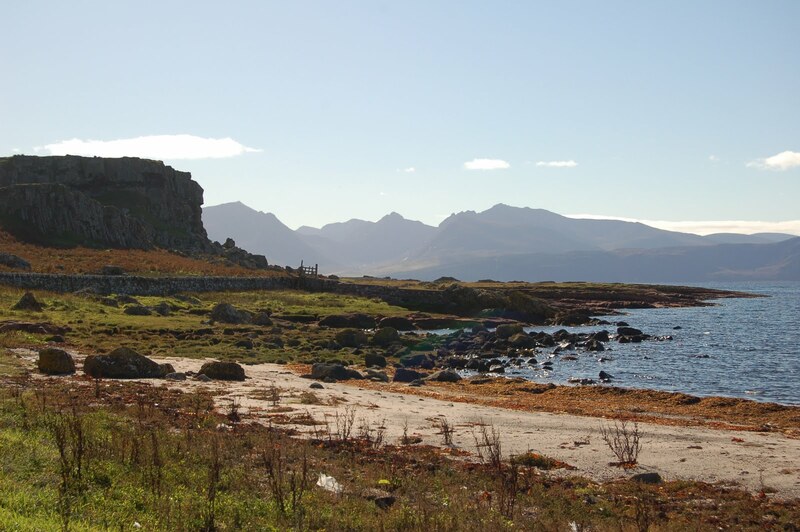 This castle was built early in the thirteenth century when Bute was on the frontier between the Norweigan empire and the Scots kingdom, and was beseiged twice by Viking fleets soon after being built. A personal frontier was about to be broken, as we headed out of Rothesay for the first ever time and into Bute. 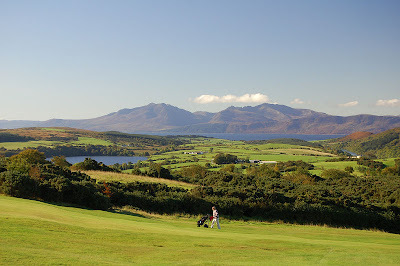 The view from the top of Canada Hill, looking over Rothesay Golf Course, gave us a hint of the scenery in store. Whenever I've been to this area before, it has been on business: the business of climbing hills. However a schedule enforced by a bad knee meant the low-level charms around Roybridge got a look in this weekend. 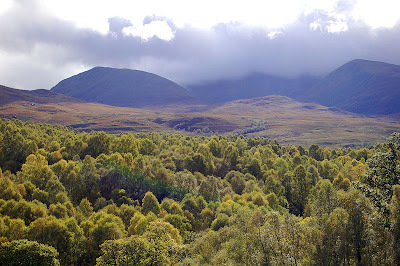 The weather was poor, so no great loss to miss out on some hilltops. I'd often fancied seeing the gorge on the River Spean (there are actually a few), and so we wandered from Roybridge, heavily hungover, down the Roy to its confluence with the Spean and upstream. The undergrowth was sodden and jungly, full of slugs, lichen, oakleaves, toadstools and toads, the black River Spean flowing silently to our right, dippered. 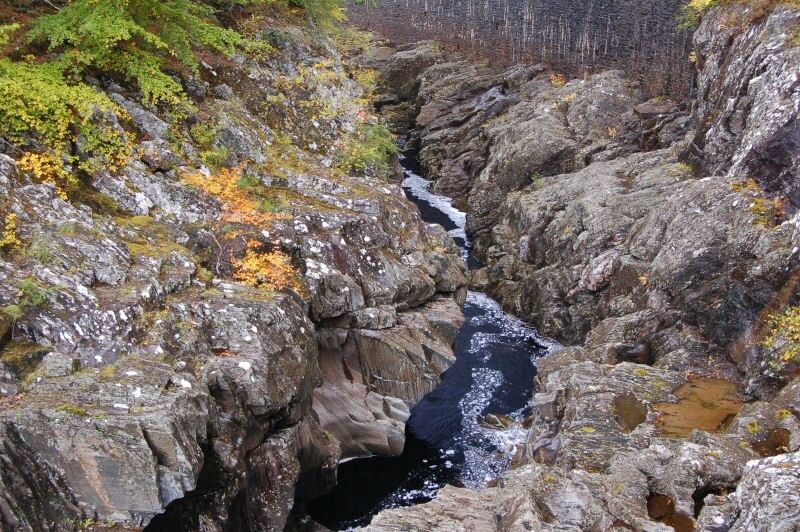 Intending to cross a bridge to a track on the other bank, we were surprised to find it down. This forced us up onto the road, seeing deer on the railway and a circling buzzard. 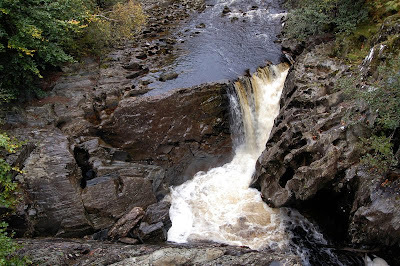 Thus the opportunity to see the gorge from below was lost, and it is only accessible from upstream, where a precarious suspension bridge hangs above the initial waterfall. 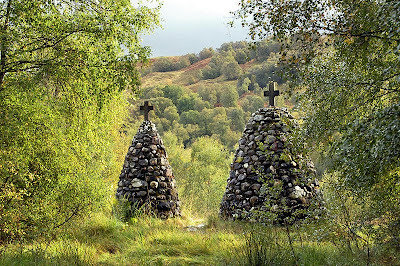 At Monessie lies a rare survival, a medieval Catholic chapel called Cille Choirill. 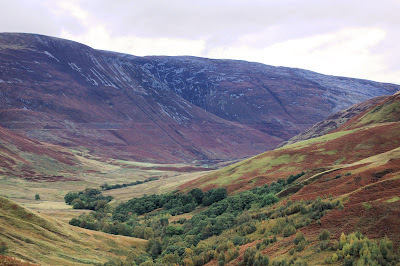 The next day was rainy too, and we walked up Glen Roy for a bit of fresh air before going down the road. 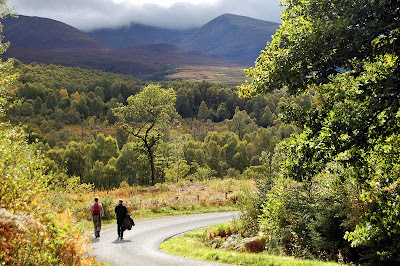 Glen Roy is home to the famous parallel roads. These perfectly parallel lines on the hillside were once thought to have been built by the mythical figure Fionn to improve hunting in the glen, but today it is thought that they are ice-age shorelines from a glacier-dammed lake, a unique feature that is not found elsewhere in the country. The sun came out on the walk back to Roybridge, lighting up delicate autumn colours in the ancient wood. With the sunshine, birdsong, and a dragonfly buzzing past, it felt like spring! 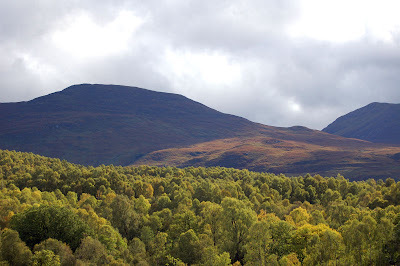 Soon, hopefully, I will be capable of climbing a small hill again: but this was a nice alternative in an area I had only previously ever been interested in seeing from up high.